Dear readers, today we have a very flavorful article. And if you are the pampered amateur like me, I hope that you will have to taste it. To arrange simple home treatments with a coffee scrubs for face and body. Refresh and cleanse the skin, making it more elastic and fragrant. Scrub our will is delicious. Surely you something like doing. I would be glad if you share your recipes for preparing such a coffee scrub. Moving away from the standard approach, drinking coffee. Profit and soul, and body. Let’s try! Useful than the coffee body scrub? What about drinking coffee and its health benefits are usually divergent opinions. Someone like this flavored drink, while others consider it harmful for health. Today we will not go into this topic. But be that as it may, beauticians repeat almost with one voice: the coffee is very useful for the skin! For scrubs generally used coffee grounds or coffee grounds. Particles of these ingredients perfectly cleanse the pores of the body fat and dirt are the perfect peeling. But not only in the beauty of the coffee scrub. a beneficial effect on blood vessels. Because of this effect, the use of the coffee body scrub is a wonderful prevention of varicose veins. If used regularly scrub the walls of vessels become more elastic, stronger, and this greatly reduces the risk of disease. In addition, natural antioxidants that are part of coffee, rejuvenate the skin and maintain its beauty. What is needed for the coffee scrub? Of course, you can buy a ready-made coffee scrub. But we are quite capable of cooking it with their hands. Not only did he get cheaply purchased, but we also will be 100% sure of its genuineness and quality! For good scrubs and masks using natural ground coffee. Be sure to pay attention to the terms and conditions of storage — delayed the coffee is better not to take! According to experts, with a view to rejuvenating the best use of green coffee. It is advisable to use organic coffee small and medium grind. Very large particles can damage the delicate skin of the face and body. Attention! Do not use for the manufacture of a variety of coffee drinks scrub! It can harm the body. From instant coffee will be of little use. Even having bought a light tan, we can get a sad picture: the color will go unevenly and very aesthetic appearance does not come out. How to use coffee grounds for scrubs? without the use of sugar, milk or cream. Grounds can be stored in a tightly sealed jar in a cool, dry, dark place for up to 5 days. Is required to be added to the scrub emollients, such as oil. And another important point — any home scrub first need to test for allergic reactions. Particularly, if the tool contains essential oils and honey. Scrub Ingredients: coffee grounds — 1 tbsp. Spoon, Brown Sugar — 1 tsp., any base oil — 1 tbsp. spoon, salt and cinnamon — the pinch. Application: all mixed, apply the scrub on your face massaged, hold for 10 minutes and then rinse. This wonderful scrub cleanses the skin. Scrub Ingredients: coffee grounds — 1 tbsp. spoon fat cottage cheese — 1 tbsp. a spoon. Application: Apply the scrub on your face, gently massage the skin, hold the scrub as a mask for 5-10 minutes. Then rinse with water. For oily skin facial scrub, this is not applicable. Scrub Ingredients: coffee grounds — 1 tsp. Finely ground walnuts — 1 tbsp. a spoon. Application: Apply on face for 5-10 minutes and wash off. This scrub will give a freshness tired skin. Scrub Ingredients: coffee grounds — 1 tsp., Ground oatmeal — 1 tbsp. spoon sour cream or yogurt, or cream — 1 tsp. Application: Apply the scrub on your face, massage your skin for 1-2 minutes, then rinse with water. Scrub Ingredients: coffee grounds — 1 h. A spoon of any fruit puree — 1 tbsp. a spoon. Application: Apply on the face, massage, a little hold on the skin, then rinse with water. This scrub is perfect for oily skin. 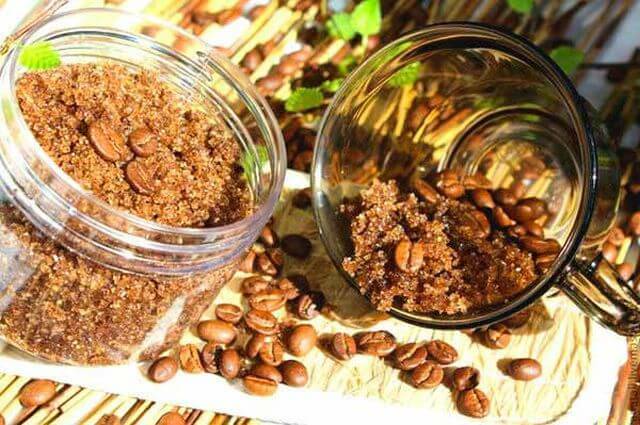 Simple and safe bet to produce a coffee body scrub — to take a little bit of coffee and one of the base oil, cream or lotion for the body. Well add to them a pinch of cinnamon — this condiment warm up the skin and give a pleasant aroma scrub. You can also add specific essential oils with anti-cellulite effect. To express scraping coffee mixed with a conventional shower gel. But, of course, much more use will bring «difficult» scrubs. Again, here we can express their imagination always use what is best for your skin, what is available at home. 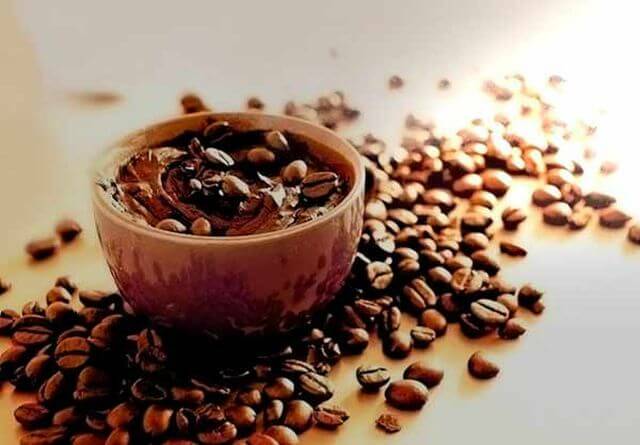 Perhaps reading the recipes, you will also discover new recipes home coffee body scrub. Scrub Ingredients: coffee grounds — 50 g clay (black suit, blue or pink) — 100 g water — 10-20 ml. Application: Apply to the body, massaging the skin for 3-5 minutes, rinse with water. This scrub can also be left on for longer as a mask. Scrub Ingredients: coffee grounds — 100-150 g of sea salt, fine — 100-150 g of olive oil — 10 ml. Application: mix the ingredients, put on the skin, massaging the body for 5 minutes. Then rinse. Scrub Ingredients: ground coffee — 2 tsp. Almond oil — 50 ml of honey or brown sugar — 2 tbsp. spoon. Application: Apply to the skin, massage and then rinse. Great for dry skin. Application: as in the previous recipe, put on a body, and hold a few minutes, then rinse with water. This scrub is suitable for skin prone to dryness. Application: Apply to the skin, to hold no more than 10 minutes. It is useful to make a light massage of the skin with a series of slaps from the bottom up. Such actions will help to deal with cellulite. The composition of the scrub coffee powder — 1 teaspoon olive oil — 1 tsp. Sea salt — 1 tsp., Ginger oil — 3-4 drops. Application: Mix the ingredients well skin. Then rinse. Application: Apply to the skin, to hold no more than 5 minutes. This scrub is the good warm up the skin and increases blood circulation. Scrub Ingredients: ground coffee — 1 tsp., Plain yogurt with no additives — 3-5 hours. Tablespoons of coconut oil — 2 tsp. Application: Apply to body massage, can hold about 10-15 minutes, then rinse with water. Scrub Ingredients: ground coffee — 1 tbsp. spoon, blue clay — 1 tbsp. a spoon. All of this breed in the mineral water to the consistency of liquid sour cream. Application: massage the problem areas on the body then wrapped an hour. How to use the coffee scrubs? if you are allergic to coffee — give up the use of coffee scrubs! Take care of your health! And you know what else I like to use coffee as a scrub for the face and body? Then you come into the bathroom, and there are magical fragrances — finish our women secrets… What are they unusual. Create it notes something elusively alluring … And another subtlety that also costs us all not to forget: try all the procedures carried out without your other half. Let them see us beautiful, radiant, inviting, but the procedure itself usually they are not very happy (of course, with humor I discuss here, but I think you perfectly understand what I mean).